Sixteen-year-old Charlotte and her fellow refugees have scraped out an existence on the edge of Britain's industrial empire. Though they live by the skin of their teeth, they have their health (at least when they can find enough food and avoid the Imperial Labor Gatherers) and each other. When a new exile with no memory of his escape from the coastal cities or even his own name seeks shelter in their camp, he brings new dangers with him and secrets about the terrible future that awaits all those who have struggled has to live free of the bonds of the empire's Machineworks. 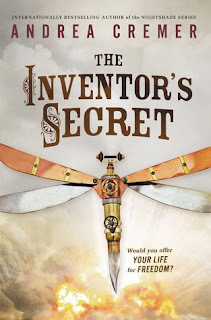 The wait for the next in the Parasol Protectorate to arrive has left me with an audiobook sized hole in my day, so I decided to to keep with the steampunk theme and picked up Andrea Cremer's The Inventor's Secret. I've picked it up while browsing the shelves at my library at least a half dozen times, but as luck would have it, I was able to get my hands on the digital audiobook. And then I proceeded to listen to the 7+ hour audiobook in one day. I'm starting to think I have a problem. The Inventor's Secret is set in an alternative U.S. history with a steampunk flair. The rebels live underground while the British Empire exists in a floating city filled with pomp and circumstance. Charlotte and her brother Ashley lead the band of revolutionaries who have stumbled upon a British ship. Their hope is to make their way to the floating city and find some important allies to take down the empire. And finally...at the end of the book...we get the "inventor's secret," and it was not as dramatic as I was anticipating. Perhaps the "secret" will gain more momentum in the sequel. Overall, a decent read. It's mostly a love story, but there is a bit of intrigue thrown in, and I think they mentioned dirigibles once. I had a little trouble imagining this world, but I'll admit there were times I was distracted while listening. Charlotte has some growing up to do. She wants to believe that she is an adult, ready to take on the empire. And she does have some mad fighting skills. But she's still a girl in many ways, a girl who might have benefited from having her parents around a bit more. Maybe this weekend I'll tackle the next in the series.